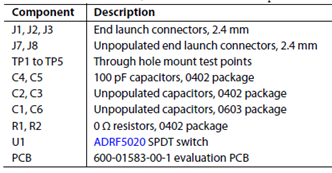 ADI公司的ADRF5020是30GHz RF通用单刀双掷(SPDT)和单刀四掷(SP4T)开关,采用 20 引脚和 24 引脚基板栅格阵列(LGA)封装，提供高隔离度和高达30GHz的低插入损耗,超宽带频率范围为100 MHz至30 GHz,非反射式50 Ω设计,低插入损耗2.0 dB(30 GHz时),高隔离度60 dB(30 GHz时),高输入线性度,1 dB压缩(P1dB)28 dBm,三阶交调截点(IP3)52 dBm(典型值),主要用在测试测量,微波无线电和甚小孔径终端(VSAT)以及军用无线电,雷达,电子计数测量(ECM)和宽带通信系统.本文介绍了ADRF5020主要特性和功能框图,以及评估板ADRF5020-EVALZ主要特性,电路图,材料清单和PCB设计图. 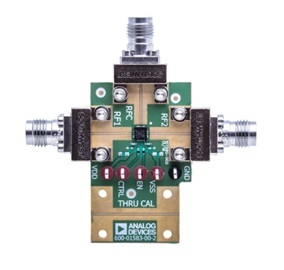 The ADRF5020 is a general-purpose, single-pole, double-throw (SPDT) switch manufactured using a silicon process. It comes in a 3 mm × 3 mm, 20-terminal land grid array (LGA) package and provides high isolation and low insertion loss from 100 MHz to 30 GHz. 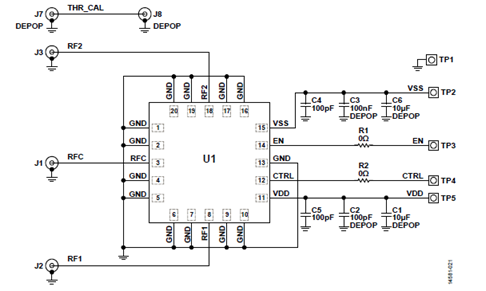 This broadband switch requires dual supply voltages, +3.3 V and −2.5 V, and provides CMOS/LVTTL logic-compatible control. The ADRF5020 requires a positive supply voltage applied to the VDD pin and a negative supply voltage applied to the VSS pin. Bypassing capacitors are recommended on the supply lines to minimize RF coupling. 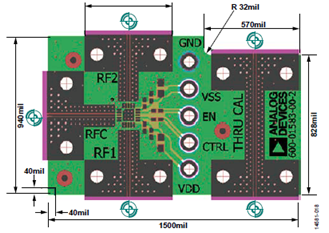 The ADRF5020 is internally matched to 50 Ω at the RF common port (RFC) and the RF throw ports (RF1 and RF2); therefore, no external matching components are required. All of the RF ports are dc-coupled to 0 V, and no dc blocking is required at the RF ports when the RF line potential is equal to 0 V. The design is bidirectional; the RF input signal can be applied to the RFC port while the RF throw port (RF1 or RF2) is output or vice versa. The ADRF5020 incorporates a driver to perform logic functions internally and to provide the user with the advantage of a simplified control interface. The driver features two digital control input pins, CTRL and EN. All RF and dc traces are routed on the top copper layer whereas the inner and bottom layers are grounded planes that provide a solid ground for the RF transmission lines. Top dielectric material is 8 mil Rogers RO4003, offering good high frequency performance. The middle and bottom dielectric materials are FR-4 type materials to achieve an overall board thickness of 62 mil. The RF transmission lines were designed using a coplanar waveguide (CPWG) model with a width of 14 mil and ground spacing of 5 mil to have a characteristic impedance of 50 Ω. 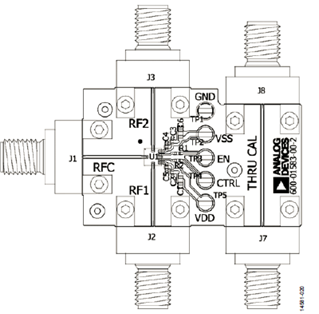 For good RF and thermal grounding, as many plated through vias as possible are arranged around transmission lines and under the exposed pad of the package. Two control ports are connected to the EN and CTRL test points, TP3 and TP4. On each control trace, a resistor position is available to improve the isolation between the RF and control signals. The RF ports are connected to the RFC, RF1, and RF2 connectors (J1, J2, and J3) that are end launch 2.4 mm RF connectors. A through transmission line that connects unpopulated RF connectors (J7 and J8) is also available to measure the loss of the PCB. Figure 21 and Table 5 are the evaluation board schematic and bill of materials, respectively.